What is the BEST TV Series for Learning English? We all know that learning English with TV shows is a fun and motivational way to develop our listening, pronunciation, and fluency. Does it matter? Are some series more conducive to learning than others? The answer is YES, and although there are HUNDREDS of English-language TV shows that you can enjoy and learn with, ONE is still arguably the best, even with more than 10 years since it first aired. The sitcom1 Friends in particular has been the subject of various academic studies and articles, focusing on both the cultural and linguistic impact. This may come as no surprise. On more occasions than you would believe, I’ve met people who have excellent English, superb2 pronunciation, and have never lived or even visited a country where the language is spoken. Again and again, when I asked how they got such great English, a contributing factor has been watching the entire series of Friends. Just the other day, I even met a girl here in Barcelona who said she had gotten fluent in Italian by watching the dubbed3 version of the series! At first, I thought it was a strange coincidence. It’s just a TV series, right? Why would this one series be a tool for success for so many? Some more research revealed to me why Friends, even more than 10 years after it went off the air4, can still be considered one of the best TV series for learning English. I’d love to hear your opinion after reading, so remember to comment below! First, it’s worth noting that Friends is a sitcom, which, in general, show the everyday life of the characters, making humor that perhaps relates to our own lives. Sitcoms are better than dramas and other genres for learning because they portray scenarios in which you probably find yourself every day, and therefor are composed of vocabulary that will be most useful for you in reaching conversational fluency. This doesn’t mean that you can’t learn a lot with a drama like Game of Thrones or Breaking Bad, but the vocabulary you obtain will rarely be useful. So if you’re not already an advanced English speaker, I’d recommend you start by watching English sitcoms. Friends rises5 to the top of sitcoms because you can surely relate to at least one of the characters. Friends is a show about people who sit around and talk, as all of us do with friends and family, and linguistically this has helped make it a very similar example of natural conversation in real life. The show’s relatability is also part of the reason why it’s had an influence on English language and grammar. Americans watch around 35-40 hours of TV per week (almost as much as they work! ), so it’s pretty natural that it can affect the language. Friends may have begun in 1994, but the language is still very relevant. In fact, it has helped shape how English is spoken nowadays in some apparent (and not so apparent) ways. This show has influenced the way Americans speak English, including the grammar. One example is with a study on the use of intensifiers. Conventionally speaking, “very” and “really” are considered the most common, correct and proper intensifiers. I’m sure you learned this at school. However, in part through Friends’ influence, “so” became one of the most common intensifiers in the English language. This is affirmed by a University of Toronto study that identified “so” as the most common intensifier within the Friends’ scripts, comparing it to North American English before and after the show. Another instance of this is with the word “totally.” You probably know the meaning, which is whole or complete. In the 90s this word was starting to be used to show strong agreement, Friends helped to take a growing trend and make it mainstream. Example: This restaurant is totally the best in the city! A: Are you coming over later? B: Totally! Both “so” and “totally” are still commonly used in American (and British) English today. In another study by Quaglio, comparing Friend’s script versus face-to-face conversation, Friends scored just one point lower in grammatical context than face-to-face conversation (34 vs. 35). To give you more context, most academic and formal materials fall between -15 and 10. Therefor, Friends is an excellent example of how to observe grammatical use in real life, presenting a large variety of grammatical structures in use. (Quaglio p. 197, Corpora and Discourse). In his study, Quaglio deduced that, “…numerous examples of features that characterize natural conversation can be illustrated with a television show such as Friends,” and “[Friends] shares the core linguistic features of conversation… the language of Friends, overall, is a fairly accurate representation of face-to-face conversation.” (Quaglio p. 208, Corpora and Discourse). Vague language is very common in native speech. It is used to speak informally in a friendly way, or when you are not sure of details or are trying to save time in conversation. To wrap up7 this subject, it’s worth noting that some of Friends’ language, e.g. quotes and catchphrases8, have penetrated English, and are still used today. But we’ll discuss that more in the next section. Some aspects of how Friends influenced American culture can still be seen today. And it’s not just in the U.S.A., it was so popular in the United Kingdom, according to the Telegraph, it’s even had effects on British culture. 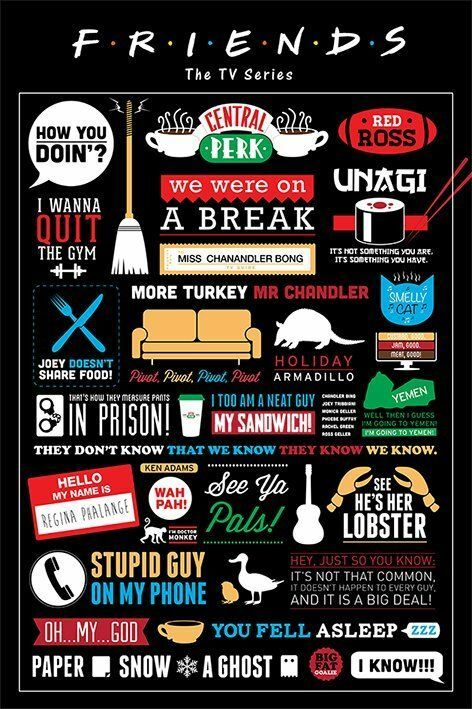 Other less common lines from the show might still be heard used between Friends fans, for example, “He’s her lobster” and others in this poster. The famous haircut worn by Jennifer Anniston during part of the series, had viral success in the U.S. and abroad, and was so closely tied to the show that it is still named after Anniston’s character, Rachel. Finally, Friends was important at the time (and is still relevant) because it challenges societal taboos, for example: Being divorced, being single over a large period of time, and casually dating various people. Now before concluding this article, I want to touch on what Friends lacks to make it a perfect English learning resource. It is impressive how close Friends’ comes to face-to-face conversation, however it’s not perfect. Quaglio points out that, as with any show, it is rare to find overlap and interruptions in discussion, which is common in natural conversation. This can also create a challenge for non-native speakers to understand group conversation in real life. However, you will get practice with this when you actually start speaking. 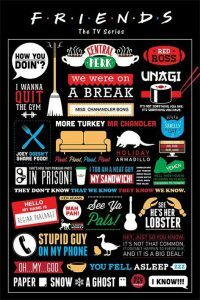 Shows like Friends provide a tremendous11 base for your English listening skills, far beyond what you learned in school. 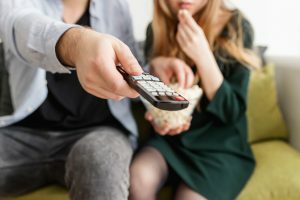 Although you can learn just watching TV shows, if you want to use them to really gain fluency, consider using some techniques to make your learning powerful and effective. There are some great recommendations in this video. If you don’t have a lot of time to dedicate to these sorts of techniques, we’ve helped make it easier with our course Fluent with Friends. To get a free taste of the course, check out some of our best, free lessons on Learn English with TV Series on YouTube. Until next time, be sure to let us know if you have any questions down below! What happens next? After the Immersion course? The Fluency circle ( facebook) still needs a little bit more vividness. I would love us to post( is that even a sentence?) videos there and get feedback about our pronunciation ,word order and so on. How can we practice more? You know, language partners really don’t wonna correct you. How can I get more podcasts from you, guys? Hey Birgit, thanks for your feedback, and it’s wonderful that you took such great advantage of the course. As for your speaking, yeah it’s really important to USE your English and open your mouth for sure. That’s why we’re building the Speaking Platform! As far as the liveliness of the Fluency Circle Community, I really recommend that you join the WhatsApp group because if you got to know what’s happening there you’d realize it’s a pretty LIVELY and VIVID place of global connection. AND if you’re in the group you’ll have the opportunity to speak and use your English! So what happens next? You gotta start living it, and doing that with real people in the real world, so I would recommend for you to join the Fluency Circle WHATSAPP GROUP! Thanks for your comments and feedback! Hi everyone, I’m Marco from Italy. I have started the fluent with friends course the last summer, and I totally agree on the fact that it’s one of the best series to become fluent and learn everyday English. Moreover, as Justin said, the WhatsApp group is a game changer cause it gives me the possibility to stay connected 24/7 with the best community of English learners ! Yea, I agree with you! You know, in my country, some of high school teachers choose Friends as extra materials to train their students’ listening! That’s the reason I bought the FwF course without hesitation! I had been dying to understand this TV series for a long long time, and you guys really went above and beyond with this course!! I learned a lot of slang, connected speech, and American cultures from it! I just want more english so I would speak other days with you. I would like use face-time or skype for improve my language skills. If someone who want to practice with me, please contact here. I’ve followed you recently on YouTube! I like it! I’d try to watch a Friends to can improve my English really, but how to watch it- with or without subtitles? Every time as I want to watch without subtitle I fear I can’t understand it… If you can to help me…? I’ve learned English from primary school but I have the feeling I can speak English in the conversational way after many times… Now I’m 26 years old…It’s late for me? When considering whether or not to use English Subtitles for the first time you watch, ask yourself what percentage of the dialogue you understand without subtitles. Are you able to understand the general idea without subtitles? Remember, subtitles are “a crutch” (artificial support mechanism), and the sooner you are able to stay engaged without subtitles, the closer to our goal of understanding natives without subtitles you are. But if that’s particularly hard at this point, don’t feel bad starting the course with English subtitles until your listening improves enough to remove them. If you’ve tried to watch the scene the first time with English subtitles and feel like you’re close to understanding the general idea, keep going. But, if you feel completely lost, you may choose a different strategy: instead of watching with English subtitles to start with, watch the entireepisode with subtitles in your native language. This will give you the context you need to go through the most crucial steps of the Power Learning Method, which will help you build your English understanding of the episode scene by scene, as our method instructs: First by reading and studying the PDF Power Lesson, Then by watching with English subtitles, frequently stopping, going back, and referencing the Power Lesson. Repeating until you’ve learned the material well. removing the subtitles and repeating this step. Once you feel comfortable with the scene, watch it again, with and/ or without subtitles. Because you lack the vocabulary and/ or reading ability to understand English subtitles the first time you watch it, it’s going to require more work for you to build both your reading and listening comprehension together. If you persist, however, you will see dramatic improvements in both of these skills over the coming weeks and month.